I am a nobody. Treat me as a solar myth, or an echo, or an irrational quantity, or ignore me altogether. Humility is expensive. Only heroes can plausibly claim to be Nobody – think of Ulysses’ reply to Polyphemus. The rest of us are always cheaply trying to pass ourselves off as Somebody. St Corbinian supposedly rode a bear over the Alps to Rome after it had killed his horse. 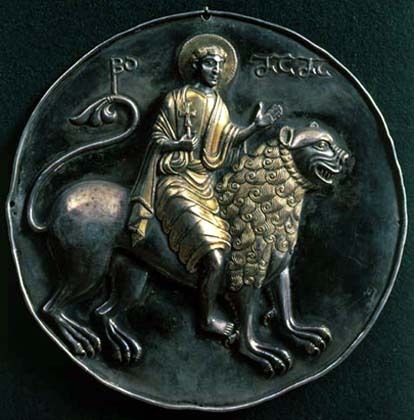 In most versions of the story he merely forced the bear to carry his baggage, but in one he actually saddled the bear and rode it, imitating, perhaps, the third-century Cappadocian martyr St Mamas who had ridden a lion. I have recurring dreams of bears. In one dream last week I’d unaccountably set up our camping tent mere meters from a bear sleeping on a pile of chewed limbs and mangled carcasses; I managed somehow to keep the children hushed long enough to dismantle the tent without waking it. In other dreams I’ve been variously pursued or ignored by bears, in wild or in urban settings. Even when they aren’t particularly threatening, my dream bears are unpredictable, objects of mute horror and chthonic dread, something like Melville’s sharks. These dreams are probably explained by my three encounters with ursus americanus in the Sierra Nevada. In the first, a mother bear and two cubs ransacked our campsite several times over the course of a night. In the second, miles from any roads or assistance, an adolescent male tried to make off with my pack and food and then circled the tent, breathing heavily, till morning. In the third, I was sleeping without a tent and woke to find a giant black bear immediately beside me tearing open a companion’s backpack, hot on the scent of an empty candy bar wrapper. At a bookshop I once consulted a poorly conceived dream dictionary and learned that bears represent pretty much whatever you want them to represent: conflict, victory, aggression, mastery, life, death, sexual vigor, sloth, renewal, power. The bear also, of course, symbolizes Russia, and California, and so it’s possible that my dreams are spurred by unresolved complexes left over from my Cold War childhood, or conflicted feelings for my home state. St Corbinian taming the bear represents, I suppose, the triumph of the Apollonian over the Dionysian, civilization over barbarism, the light of the Church over pagan darkness. My dreams are full of foreboding. If they don’t devour me outright, my dream bears, I think, are as likely to ride me as I am to ride them. But clearly there’s no chance of that. Mandelstam once wrote that “only in Russia is poetry respected – it gets people killed.” He was last seen at a gulag transit station in Vladivostok in 1938. Under the imaginary table that separates me from my readers, don’t we secretly clasp one another’s hands? Books as communion and consolation. We wish it were literally true in the case of Schulz, so that taking him by the wrists we might pull him through the text to safety – out of the Drohobycz ghetto and the sights of the Gestapo officer who murdered him. But we pick up the book, we turn the page, and see – we aren’t entirely empty-handed. At the bookshop years ago I had a colleague named Jefferson who slicked back his hair and wore a black three-piece every day and who claimed that in his childhood living room was hung a large framed reproduction of Goya’s Saturn Devouring His Son. It was a favorite of his mother’s, he said. Images have consequences. Staring at that picture over the hearth every day might lead one to question parental intentions. Father’s dinner table enthusiasm for chops or roast turkey, for example, might take on frightful overtones. I took Jefferson’s biographical datum as a partial explanation for Jefferson himself. He was not a standard-issue sort of fellow. Clearly he’d been inoculated against normalcy early on. As a boy I questioned my parents’ intentions toward me too. I believed for a while that I was the last true human being left in the world and that my parents were, in fact, alien robots in skin suits, biding time till I could be conveniently liquidated to make room for a robot boy in a skin suit who would take my place. I had to be vigilant. Several times at breakfast I asked my father whether he would admit to poisoning my bowl of Shredded Wheat. He would not. Were there pictures in the house to explain my fears? I don’t recall any framed photos of robot impostors. Probably it was the television, too much Battlestar Galactica or Land of the Lost or V. What we did have in the house was a flock of macramé owls. Once I’d been done away with to make room for the robot boy, how dreadful to be wrapped up and buried in a macramé shroud. In fact, there was one very odd painting in the house, the work of my mother’s cousin. I own it now. It shows an ocean of choppy waves extending to the horizon, nothing more. It might have made a suitable setting for an old-fashioned frigate or schooner tacking in the wind, but the ship got left out. There are only waves. What is it intended to depict? Chaos? Infinity? Just the regular old sea? Or perhaps the primordial Miltonic sea a moment or two before the Holy Spirit “with mighty wings outspread / Dove-like satst brooding on the vast abyss?” It doesn’t explain the alien robots in skin suits, but it might explain the first story I ever wrote, about a cruise ship foundering at sea and a boy floating alone in the blue immensity. I wonder how my children have been affected by the pictures in our home. There’s the kitschy Keane-esque painting of a little girl with big eyes crying serenely in a dark hallway. There are the little framed phobias: Fear of Birds and Fear of the Dark. There’s the wooden icon of the Forty Martyrs freezing to death on a lake of ice. 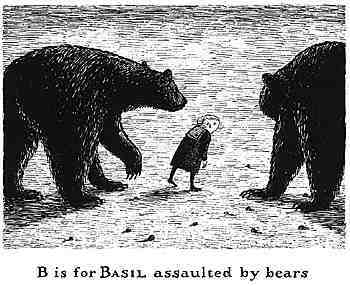 And then there’s the framed print of Edward Gorey’s Gashlycrumb Tinies, an alphabet of gruesome deaths of children. Can any good come of this? I prefer to accept as a motive not the thing I fully understand but the thing I partly understand. Utter clarity of explanation to me is false. Among my less charming personal faults is the inability to understand the motives for my own words or actions. When asked to explain myself I take up the task with real curiosity. I’m as eager as anyone to hear what I have to say in my defense. Sometimes the motives I uncover are interesting or enlightening for me personally, but they frequently fail to convince. I admit that explanations volunteered by others often sound more plausible. Still, I feel misunderstood.